Foreigner and Eagle Vision have announced the release of the concert film, Foreigner Live At The Rainbow ’78, which is available on DVD, Blu-ray, and digital video on March 15th. A performance clip of the song, Hot Blooded, can be seen at the bottom of the page. 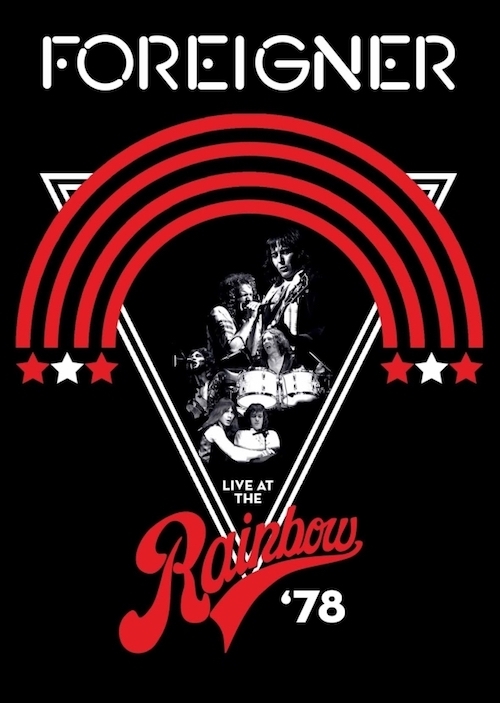 After the band’s self-titled debut album had spent a year in the U.S. Top 20, rock’s conquering heroes played a sold-out show at London’s celebrated Rainbow Theatre on April 27, 1978. Opening with Long, Long Way From Home, fans were treated to a magnificent display of musicianship and performance, including hit singles Feels Like The First Time and Cold As Ice, as well an exclusive preview of two tracks from the upcoming Double Vision album, Hot Blooded and Double Vision. As Foreigner’s music continues to resonate with fans old and new, the band celebrated their 40th anniversary playing amphitheaters and arenas throughout 2018. ‹ 2/9/19: BACK FROM CRUISE TO THE EDGE, PAUL RODGERS THIS WEEKS PODCAST, SAXON IN TULSA WED. I am so getting this DVD! Foreigner at their best! Can’t get enough of the good old days. This is amazing!!! And no back tracking or whole recordings being played. Now more bands need to do this also! Dig deep and find some good video to give the fans. This may be the best rock music release since Deep Purple Perfect Strangers live dvd!